Network Monitor Agents (also known as a network probes) can be very useful in assisting with networking issues remotely. 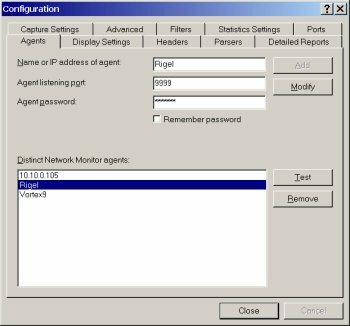 A Network Monitor Agent is a separate application that must be installed on the remote system to be monitored. It will send the traffic that is visible for the monitored system to DNM over a dedicated port. This is a great way to do remote support for systems that are not physically within your reach. 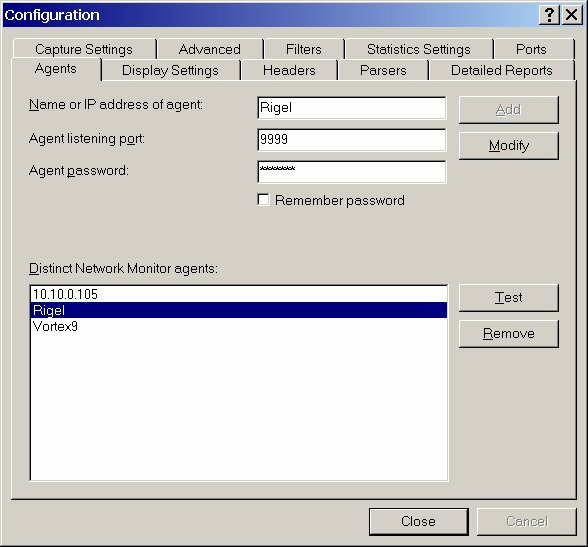 Distinct Network Monitor comes with one Remote Agent to allow the monitoring of a remote network segment. Additional Agents may be purchased separately when needed. By installing additional Agents on remote segments you will be able to get a more complete picture of your network. Agents can be configured to use filters if you wish to reduce the amount of traffic that the Agents will send to Network Monitor for analysis. The Agents or network probes are a very usful tool for remote problem diagnosis but are not a substitute for Network Monitor when gathering of statistics is required over several hours on a daily basis, as the information gathered at the Agent is transferred to Network Monitor in real time. In the latter case it is more efficient to have Network Monitor gather the statistics locally.